On a dark street near the arched shadows of the railway bridge over ul. Grzegórzecka, a blue van selling grilled kiełbasa commands the attention of hungry locals, and a motley parade of unsteady revelers, from Monday to Saturday. Though the appearance of the Communist-era Nysa van and weathered Polish men cooking sausage over an open fire is at first more ominous than inviting, the owners, Marek Deląg and Alexander Malik, insist that their van, ‘Kiełbasę z Rożna,’ is extremely popular among tourists: “It’s in every guide book,” Malik points out. It seems Malik’s claim is true – over 7,000 fans on Facebook, long lines every night and its prevalence in Google searches shows that it is a must-see place. But its popularity does not detract from its charm. “Going to the kiełbasa van is like a step back into another era,” said American expat and customer Leslee McCoy. “The van, the man cooking, the sodas, the people eating… all happily filling their bellies with a taste of tradition,” she said. Kiełbasę z Rożna’s quirky opening hours (8pm–3am) make for another unique selling point. “I cannot imagine going there during the day. The bridge, the location and the flames all lend themselves to darkness. They go hand in hand to create the fine-tuned operation that it is,” McCoy said. 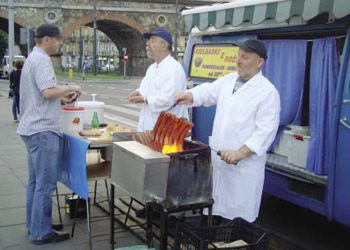 Like the Zapiekanki stands in Plac Nowy, Kiełbasę z Rożna sells only their specialty – kiełbasa cooked on large skewers over an open fire. They are served with a fresh roll and a squirt of mustard. Ketchup is extra and the meal is really not complete without a bottle of Oranżada – a clear soda with a flavor akin to bubble-gum. “The van is a symbol of past times. It’s something like a relic,” said Michał Sienkiewicz, one of the many students who visit the van after an evening in Krakow’s bars. “I go there sometimes for kiełbasa when I’m drunk, it’s near my apartment. It is very good Polish food,” he enthused. Malik and Deląg say they have many regulars, and Kiełbasę z Rożna has built its popularity over the past 20 years. The two friends were cab drivers before opening the business, an occupation that got them used to dealing with people from all walks of life. “University professors, drunks, prostitutes, priests, famous people – everyone comes here for kiełbasa. Even Jolanta Kwaśniewska (the wife of former President Aleksander Kwaśniewski) came here,” said Malik. “It’s also popular among Asian tourists. A group of Japanese tourists once told us that our van had a special on a television show there,” Malik said. Though there is always someone in line, weekend nights are best for exciting encounters with random strangers. “I love the place almost more for the people watching and the social experience, but of course the sausage is great too,” McCoy said. “Kiełbasę z Rożna is part of the landscape of the city,” said Malik. “The tourists come to Krakow for Wawel, the Rynek and kiełbasa. Krakow wouldn’t exist without it,” Malik said.